Contextualising the Play Miss Julie is reflecting in this society since the way Stanislavski creates a 'scientific' system for realistic characters in naturalistic plays, focuses on the development of the artistic truth onstage by teaching actors to 'live the part' during the performance Stanislavski developed the system to be applied to all forms of theater, directing and producing melodrama, vaudeville, opera, etc. In order to create an ensemble of actors all working together as an artistic unit, he began organizing a series of studios in which young actors were trained in his system. Stanislavski told the actors to use their own memories in order to naturally express emotions. Stanislavski later worked on The Method of Physical Actions focus was on the physical actions inspiring truthful emotion, and involved improvisation and discussion. The focus remained on reaching the subconscious through the conscious. Also made a system called the 'Magic IF' telling the actors "What would I do if I were in this situation?". 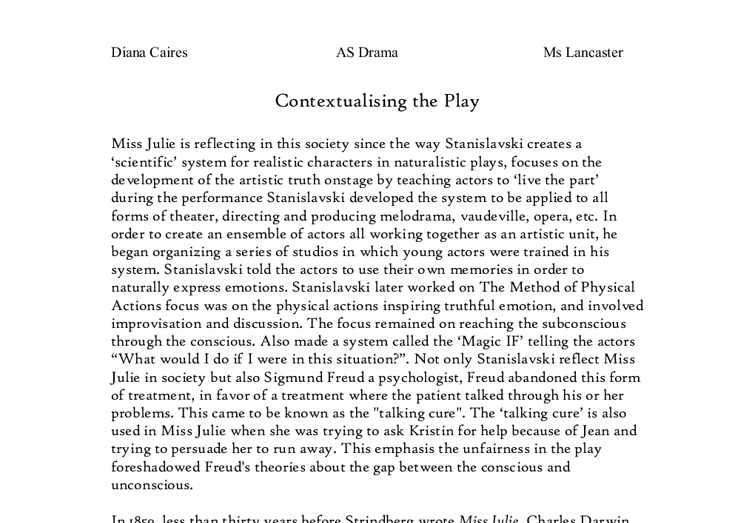 Not only Stanislavski reflect Miss Julie in society but also Sigmund Freud a psychologist, Freud abandoned this form of treatment, in favor of a treatment where the patient talked through his or her problems. ...read more. Workers in Sweden began to strike for higher wages and shorter workdays. In 1881, a law was passed to limit child labor in factories, but it was not until 1909 that all adult males in Sweden were given the right to vote. The possibility of social movement was becoming greater at this time as well. 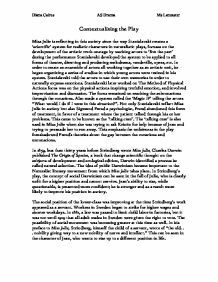 In his preface to Miss Julie, Strindberg, himself the child of a servant, wrote of "the old. . . nobility giving way to a new nobility of nerve and intellect." This can be seen in the character of Jean, who wants to rise up to a different position in life. The position of women in society was also an important issue as well. In 1845 that women in Sweden were given the right to own property. In 1846 women were also given the right to hold certain specific jobs such as teaching, and finally, in 1862 the right to vote. In the 1870s, women were let into the universities for the first time, although they were not allowed to study theology or law. ...read more. Strindberg did other plays as well including 'The Father' and 'The Dream Play'. Miss Julie is one of his first naturalistic plays as he went on to do other plays for example 'The Dream Play' doesn't have a clear story and its completely non-naturlistic while Miss Julie you could understand the story plot because naturalistic tragdy play, while Strindberg wrote this play he got divorced with his first wife Siri von Essen and had weird dreams when he got divorced. Futhermore Strindberg shows in 'The Father' while the father's love is concerned with the development of the child, the mother is interested mainly in the possession of the child therefore she fights the man with every means at her command. 'The Father' contains two basic truths, the motherhood has much praised, and hailed as a wonderful thing, is in reality very often the greatest influence in the life of the child while in the play the mother doesn't show the love for the child only the possession. ?? ?? ?? ?? Diana Caires AS Drama Ms Lancaster ...read more. Stage directions can also be used to reveal a characters emotion. For example, 'Miss Y glances up from her paper, nods perfunctually, then goes on reading.' This is the first time in the play that the characters are together. Strindberg has used this direction to show the audience how Miss Y feels about Mrs X.
and add emotions and detail to a play or sketch were highlighted greatly here. Concentration and attention helps the actor become completely absorbed in his work and therefore to forget the audience and other distractions, conquering their fear of 'the black hole' of the auditorium. This portrays a strong sense of grouping and gives Ui that sense of power and higher status being surrounded by people. She feels his arms, Julie commands him to kiss her hand and thank him. ==> Jean tried to kiss Miss Julie but she slaps him ==> Julie asks Jean if he has ever been in love. He replies that once he got sick with love.